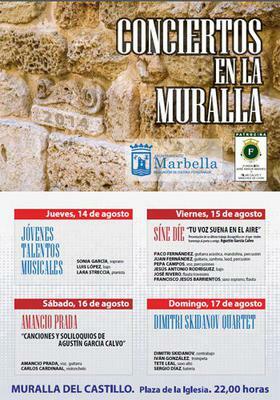 Conciertos en la Muralla (Concerts in the wall) organized by Marbella Town Hall are taking place from August 14 to 17 in the the Church Square/Plaza de la Iglesia in Old Town Marbella. Friday, 15-SINE DIE. "YOUR VOICE SOUNDS IN THE AIR"
Saturday, 16-AMANCIO PRADA. "SONGS AND SOLILOQUIES BY AGUSTIN GARCIA CALVO"